In Berlin the past is always present, and the present is on the fast-track to the future. Nearly twenty years after the Wall tumbled, Berlin has shed its dour Cold War demeanor and grown into a confident, sassy, irreverent city. Europe's "it" capital buzzes with zest for experimentation infused with an undercurrent of roughness that give this "eternally unfinished" city its street cred. Unemployment and the municipal debt may be high, but otherwise, Berlin is hitting on all cylinders. The fashion, art, design and music scenes are all exploding, fueled by artists and creative spirits streaming in from around the globe. No other European city has been more in the crosshairs of history throughout the 20th century: Berlin staged a revolution, was headquartered by fascists, bombed to bits, divided in two, reunited, made a capital, and now, at last, rebuilt again. Wherever you go, historical monuments pictured in your school textbooks rub up against avant-garde architecture. From world-class museums to edgy galleries, top-notch opera to underground clubs, gourmet restaurants to funky snack bars—regardless of your tastes, you'll find it in Berlin. Naturally such variety also extends to your lodging options. Craving style and luxury? You'll be happy at the Rafael Moneo-designed Grand Hyatt with its 'pool in the sky' or the Radisson SAS whose lobby is anchored by a three-story-tall tropical aquarium. In a romantic mood? Check in at the Honigmond Garden Hotel and be enchanted by the flower-filled backyard complete with fountains and koi pond. Ready for something unique? Nothing fits the bill better than the Arte Luise Kunsthotel, a veritable 'gallery with rooms', each designed by a different artist. All of these properties are smack dab in the eastern city center, the most interesting and historic section of Berlin. They're also within walking distance of the blockbuster sights, great shopping, restaurants and entertainment. Best of all, Berlin is one of Europe's most affordable cities. A night in a four- or five-key hotel averages $215 compared to $540 in London or $520 in Paris. A substantial breakfast is almost always included in the room rate, so be sure to fuel up before venturing out each day. In Berlin restaurants, the price of an entrée would merely buy an appetizer in Los Angeles or New York. Getting around is a snap with the excellent and easy-to-understand public transportation system (buses, trams, subway) and cheap and plentiful cabs. 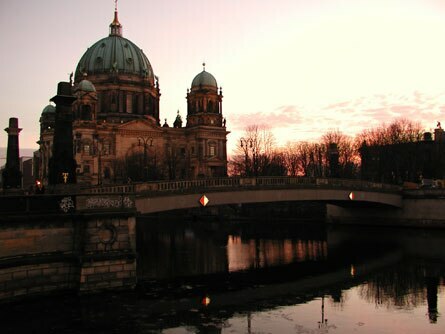 Fun, safe, easy to navigate and affordable, there's a vibrancy about Berlin that's simply irresistible. If this is your first visit, there's simply no better way to get a crash course in its history than by hopping on public Bus 100 at Bahnhof Zoo, the train station named for the animal park where polar bear celebrity Knut makes his home. 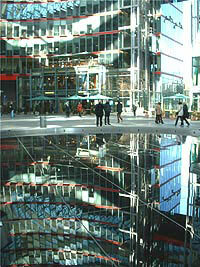 The park is located in the western city center, easily reached by U-Bahn (subway) or S-Bahn (light rail). A cab ride there will cost about €15. Bus 100 leaves roughly every 10 minutes from Hardenbergplatz square, outside the main train station exit, right next to the public transportation (BVG) information kiosk where you can pick up a route map and buy a ticket for €2.10 (tickets are also sold by the bus driver). Then grab a seat, preferably top-side, and check off scores of key sights as the double-decker trundles through Tiergarten Park, past the government quarter and along historic Unter den Linden Boulevard to Alexanderplatz Square (locally known as "Alex"). Get off the bus here and continue exploring on foot. You're now in former East Berlin. With its bombastic buildings and cluttered layout "Alex" can't quite shake its 1960s socialist looks but is now solidly rooted in 21st century commerce. Hang on to your credit cards (or not) while taking a spin around the elegant Galeria Kaufhaus department store, recently redesigned by star architect Josef Paul Kleihues, or the sparkling Alexa, a five-story shopping mall with 180 stores that opened in 2007. Yet most visitors steer towards Alexanderplatz for the elevator ride up the Fernsehturm (TV Tower) which, at 1200ft high, is the tallest structure in all of Germany. From the viewing platform little more than halfway up, you can enjoy the panoramic view and refreshments in the revolving restaurant. The TV Tower dwarfs one of Berlin's oldest buildings, the 13th-century red-brick Marienkirche (St Mary's Church). Brimming with artistic treasures, it's a quiet spot to escape the city hubbub. Older by a few years is the Nikolaikirche south of here, beyond Berlin's red-brick town hall. It's in the heart of the pint-sized Nikolaiviertel (Nicholas Quarter) whose cobbled lanes and cutesy houses evoke medieval Berlin. It was built in the 1980s by the East German government to commemorate the city's 750th birthday. To get to Nikolaiviertel, follow Spandauer Strasse south for a block and a half and cut a right on the little lane called Am Nussbaum. An excellent spot to learn more about life behind the Iron Curtain is the nearby DDR Museum. From the Nikolaiviertel walk north across Marx-Engels-Forum, a socialist-era square dominated by a huge sculpture of the two revolutionary figures for whom it is named. Cross Karl-Liebknecht-Strasse, walk down some steps to the river and the entrance will be right there. At this museum, you can turn the ignition key of an authentic Trabant car or dance the Lipsi, the GDR's answer to rock'n roll. A must for Goodbye Lenin! Fans. A leisurely way to follow up this intriguing peak into an extinct society is with a one-hour Spree River cruise through historic Berlin. Boats leave right from the dock outside the DDR museum and deliver fabulous views of the imposing buildings of Museum Island (one of Europe's oldest cluster of public museums and a Unesco World Heritage Site), the government quarter and the gleaming new central train station. Curious about what's inside those famous treasure chests on Museum Island? Easy. Get off the boat, turn right, walk past the humongous Berlin Cathedral and you're there. It would take at least a full day to see all four museums but since you've probably got limited time (or attention span), at least pay your respects to gorgeous Queen Nefertiti of Egypt at the Altes Museum. Clamber up the massive steps of the 2000-year-old Pergamon Altar and strut through the radiantly azure Gate of Babylon, both of which are at the Pergamon Museum. GDR? Prussians? Need a refresher on German history? Just cross the street for an eye-opening journey through the Deutsches Historisches Museum (German Historical Museum) whose newly overhauled permanent exhibit counts a globe from Hitler's chancellery. With bullet holes where Germany and Austria should be, it is among the museum's more startling treasures. But enough culture... Wrap up the day in the Scheunenviertel (literally "Barn Quarter"), Berlin's old Jewish Quarter that's been rebooted as a spirited shopping, eating and partying zone. It's about a ten-minute walk (or a quick cab ride, ask for the €3.50 Kurzstreckentarif) from Museum Island. Turn left as you exit the Pergamon Museum, left again onto Bodestrasse and hook a left onto Burgstrasse immediately after crossing the bridge, then right on Neue Promenade. This will take you straight to the Hackesche Höfe, the most popular of the courtyard warrens in this village-like district. Fuel up on coffee, then browse for local fashions, art and products here and in the indie shops along Alte Schönhauser Strasse, Münzstrasse, Auguststrasse and other winding lanes. The Scheunenviertel teems with dinner options. For a special treat, call ahead for reservations at Rutz, which serves award-winning creative Mediterranean cuisine and has a superb wine selection. Progressive palates will be drawn to Shiro i Shiro, a fantasy 'white castle' where neobaroque-meets-Asia both in the design and in the kitchen. If you just want a hearty German supper with olde-worlde flair, squeeze into the cozy Schwarzwaldstuben. Of course, if you want a change of venue, you won't be wanting for choices. Catch the late-night show at Chamäleon Variete, a Roaring Twenties-style variety theater in the Hackesche Höfe; mingle with the cool cats at B-Flat, one of Berlin's best established jazz venues; or swing a leg to tango, disco or salsa at Clärchens Ballhaus, one of the city's few surviving 19th-century dance halls.